TORONTO, ON, February 1, 2018—Adopt4Life, Ontario’s Adoptive Parents Association, is excited to support and provide insights on Attachment with a campaign that explores the intricacies of bonding and attaching with children and their families who have been touched by adoption. 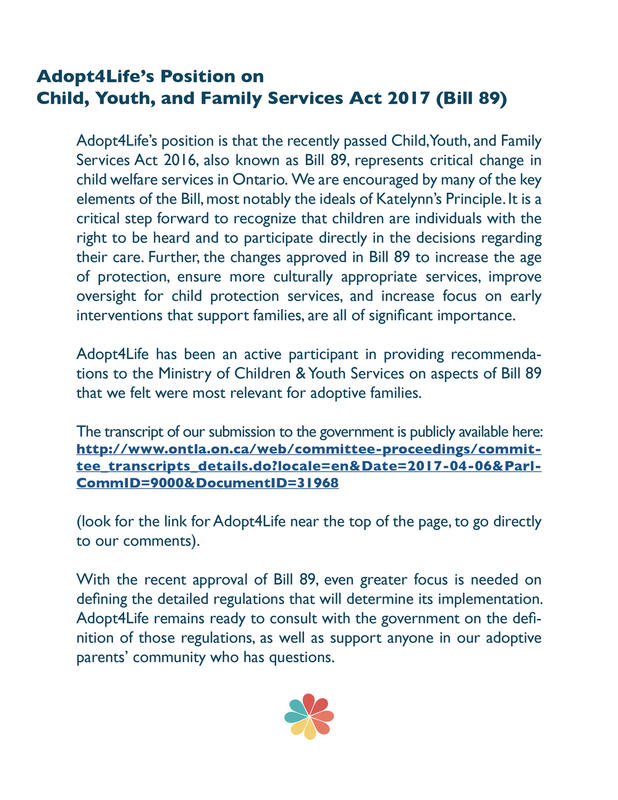 On behalf of Adopt4Life, please accept our appreciation for the statement made by Minister Michael Coteau in the Ontario Legislature on November 1st, 2017, recognizing the importance of Adoption Awareness month. As the Chair of Adopt4Life’s Board of Directors, I was deeply appreciative and thankful for Minister Coteau’s remarks. I know my feelings were also shared by everyone at Adopt4Life, particularly those in front-line service roles who are delivering the critical supports and services to families that Minister Coteau spoke of. 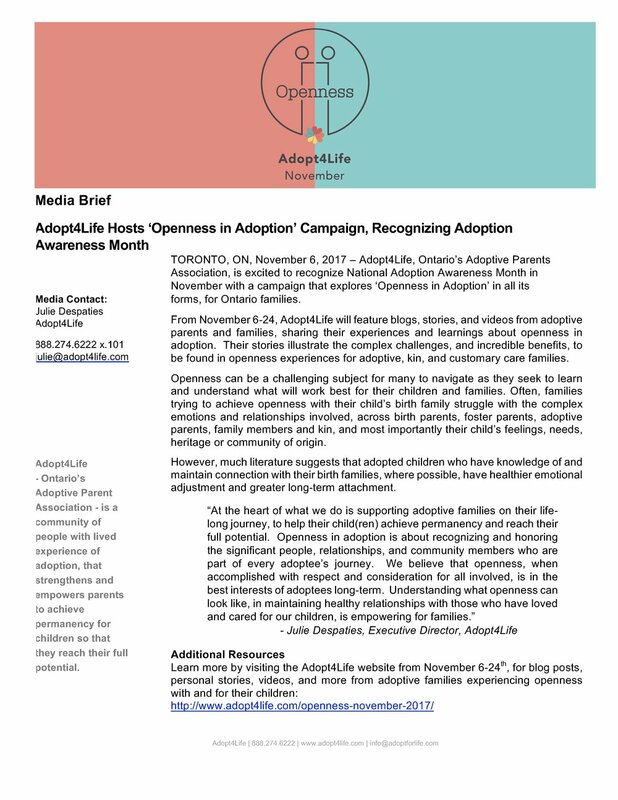 TORONTO, ON, November 6, 2017 – Adopt4Life, Ontario’s Adoptive Parents Association, is excited to recognize National Adoption Awareness Month in November with a campaign that explores ‘Openness in Adoption’ in all its forms, for Ontario families. As Adopt4Life’s Executive Director, I have the pleasure and privilege to work with a team of deeply talented individuals who are all passionately invested in our community, supporting parents and families on their adoption journeys. Today I have several important organizational updates to share with everyone regarding our Parent Liaison team. The Ministry of Children and Youth Services (MCYS) is currently working to support the implementation of the Child, Youth, and Family Services Act, 2017 (CYFSA), which was passed on June 1, 2017. As part of this work, we are sharing the CYFSA Youth, Families and Communities Discussion Guide to help gather feedback from about the implementation of the CYFSA. Please review the document and provide your feedback by September 22, 2017. The discussion guide provides the ways in which you can share your feedback. With the recent approval of Bill 89, even greater focus is needed on defining the detailed regulations that will determine its implementation. Adopt4Life remains ready to consult with the government on the definition of those regulations, as well as support anyone in our adoptive parents’ community who has questions. We are writing with our immediate and urgent request that you withdraw your March 20th directive to Ontario Directors of Education that they distribute to schools and students the flyer from the Motherisk Commission: “Were you taken from your parent by the Children’s Aid Society?” Further, we ask that you urgently notify all Boards and Directors to tell staff who have already posted the flyer (in print or online) to remove it. November is Adoption Awareness Month. Adopt4Life, Ontario’s Adoptive Parents Association, strongly support fairness and equality for adoptive families, and advocates that Employment Insurance benefits for adoptive families, including Parental Leave, be made consistent with the benefits extended to biological parents . 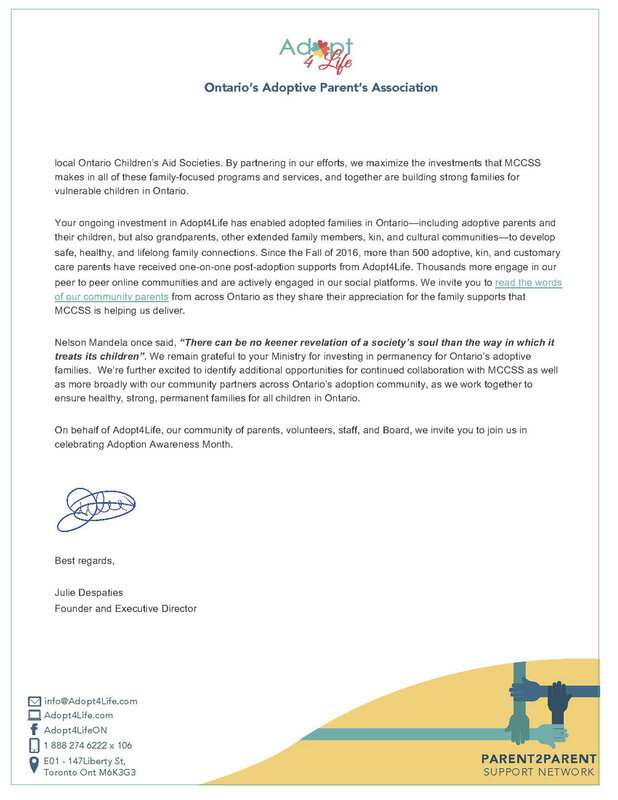 Adopt 4Life, Ontario’s Adoptive Parents Association, is excited to partner with the Ministry of Children and Youth Services in their announcement of the newly expanded Parent 2Parent Support Network for adoptive families in Ontario . 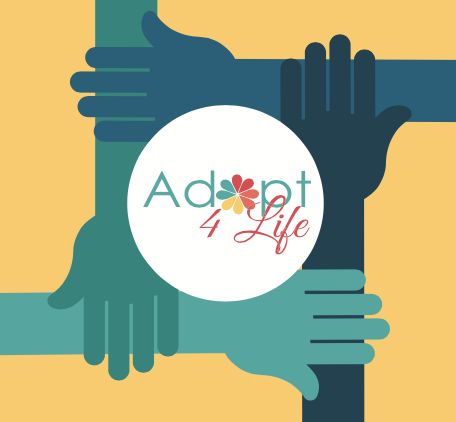 Adopt 4Life, l'Association des parents adoptifs de l'Ontario, est heureuse de collaborer avec le ministère des Services à l'enfance et à la jeunesse en tant que facilitateur auprès du réseau de soutien récemment amplifié Parent 2Parent et des familles adoptives en Ontario . AS ONTARIO ENTERS ADOPTION AWARENESS MONTH, THE PROVINCE IS LAUNCHING NEW SUPPORTS FOR ADOPTIVE FAMILIES. As Ontario enters Adoption Awareness Month, the province is launching new supports for adoptive families, including a grant program to help families cover the costs of postsecondary education for adopted children. Hundreds of adoptions have been put on hold in Ontario as a provincially appointed commission reviews child protection cases involving flawed drug tests. Take a listen to Adopt4Life's Executive Director Julie Despaties on Ottawa Morning discussing the impact of the Motherisk scandal on families, focusing on children involved. Hundreds of Ontario adoptions are currently on hold in the wake of a Motherisk drug test scandal. TORONTO — Hundreds of adoptions have been put on hold in Ontario as a provincially appointed commission reviews child protection cases involving flawed drug tests. Wait may be prolonged for up to 300 kids as the government reviews faulty hair-test evidence that may have taken some from their birth families. “This is going to be very difficult for everyone — the children, the birth families and the adoptive parents,” said executive director Julie Despaties. TORONTO – Hundreds of adoptions have been put on hold in Ontario as a provincially appointed commission reviews child protection cases involving flawed drug tests.